Laser-activated perfluorocarbon nanodroplets are an emerging class of phase-change, dual-contrast agents that can be utilized in ultrasound and photoacoustic imaging. 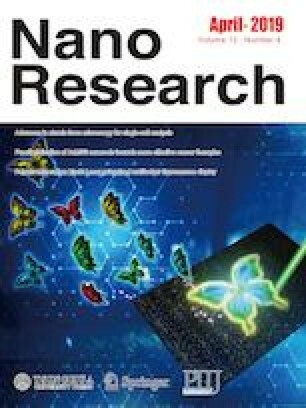 Through the ability to differentiate subpopulations of nanodroplets via laser activation at different wavelengths of near-infrared light, optically-triggered color-coded perfluorocarbon nanodroplets present themselves as an attractive tool for multiplexed ultrasound and photoacoustic imaging. In particular, laser-activated droplets can be used to provide quantitative spatiotemporal information regarding distinct biological targets, allowing for their potential use in a wide range of diagnostic and therapeutic applications. In the work presented, laser-activated color-coded perfluorocarbon nanodroplets are synthesized to selectively respond to laser irradiation at corresponding wavelengths. 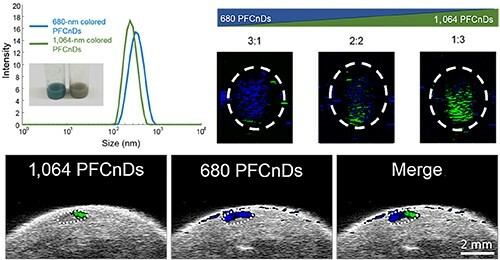 The dynamic ultrasound and photoacoustic signals produced by laser-activated perfluorocarbon nanodroplets are evaluated in situ prior to implementation in a murine model. In vivo, these particles are used to distinguish unique particle trafficking mechanisms and are shown to provide ultrasound and photoacoustic contrast for up to 72 hours within lymphatics. Overall, the conducted studies show that laser-activated color-coded perfluorocarbon nanodroplets are a promising agent for multiplexed ultrasound and photoacoustic imaging. Daniela Y. Santiesteban and Kristina A. Hallam contributed equally to this work. Supplementary material (material regarding PFCnD zeta potential, targeted droplet studies, histology, and additional in vivo imaging studies) is available in the online version of this article at https://doi.org/10.1007/s12274-019-2279-x. The authors would like to thank Diego Dumani of the Georgia Institute of Technology for his insight into background free image processing algorithm development. D. Y. S. acknowledges fellowship funding from the National Institutes of Health (No. T32 EB007507) and the National Science Foundation Graduate Research Fellowship Program. K. A. H. acknowledges fellowship funding from the National Institutes of Health (No. T32 EB007507). S. K. Y. acknowledges fellowship funding from the National Institutes of Health (No. F30 CA216939). The work was supported in part by the National Institutes of Health under Grants CA158598, EB008101 and CA149740 as well as the Breast Cancer Research Foundation Grant (No. BCRF-17-043). We also wish to acknowledge the core facilities at the Parker H. Petit Institute for Bioengineering and Bioscience at the Georgia Institute of Technology for the use of their shared equipment, services, and expertise.